BRADENTON - Governor Charlie Crist and Lt. Governor Jeff Kottkamp spent several hours in Bradenton, speaking to citizen's about issues affecting the community. Crist was asked about homeowner's association problems, the economy, and whether the Lt. 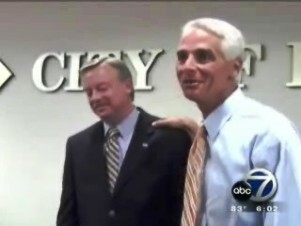 Governor would make a good Governor if Crist seeks out a vice-presidential nomination. is so important to us," says Gov. Crist. Crist was asked if the Lt. Governor would make a good Governor if Crist seeks out and becomes the vice-presidential running mate for John Mccain. Crist avoided clarification about whether he was going for the title of vice-presidential nominee, but he did show his support for Kottkamp. "There's no question that he's the greatest Lt. Governor in the history of Florida, in my humble opinion, that's why I picked him. He's a great public servant and I'm honored to serve with him," says Gov. Crist. Both met with citizens behind close doors, in private meetings, one on one. Each person got 5 minutes. Neal Carbaugh is a Palmetto resident. "Hopefully he engages on the issues that are important to a majority of the people here," says Carbaugh. He came to discuss reforming the judicial qualifications commission. He says it's the group that investigates complaints of misconduct of judges. "In their present form...I believe that they're ineffective and exist as a façade and they're really not doing their job," says Carbaugh. He's cautiously optimistic his meeting will bring about the change he is looking for. 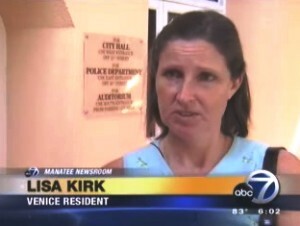 Lisa Kirk lives in Venice. "I came here to talk to him about the injustices that are happening in homeowners associations," says Kirk. She spoke to the Lt. Governor. "I feel much better because he promised me he would get in touch with the speaker of the house," says Kirk. Dan Melzer came to discuss his plan to increase state revenue by leasing land. "He's going to get back to me on it, which is good," says Melzer.